From now on, Event Management no longer is one-sided! 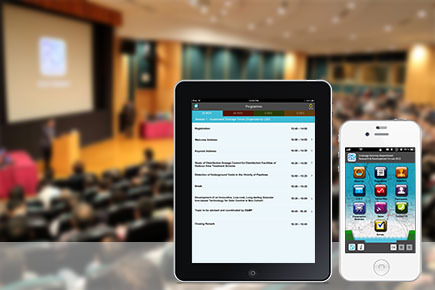 Our customized Event App Solution will make your seminars & symposiums much faster and easier to disseminate to your audiences. With multiple language choices across multiple platforms and a sleek modern layout, everyone can easily navigate the programme details in a delightful and riveting way, then submitting their feedback immediately. With a simple step-by-step Content Management System (CMS), the organizers could update the event content and layout design in just a few minutes. (1)	Schedule & Information Sharing Information, schedule as well as the details of speakers could clearly be navigated on the sleek layout. 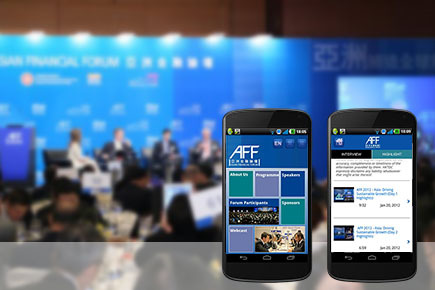 (2)	Self-Registration System While getting the updated schedule easily, participants could enroll the designated seminar themselves by just using the app. Participants’ data can be updated real time and the organizer can save certain manpower. (3)	Push Notification Alert your audience with certain news or messages by GPS location based services. (4)	Business Matching Alert Just filling in what industry the audiences are working in, and what industry they are interested in, the apps will pair up the business partners automatically. (5)	In-App Messenger Audiences can easily connected with their business partners by sending messages and emoticons through the in-app messenger. (6)	Instant Text for Q&A Section Design especially for Q&A Section during seminars, participants could send their questions to the organizers directly through the app. Saving on-site manpower. (7)	e-Survey Participants could fill in questionnaire right after the seminar and submit through the app. Save time, and save the earth!